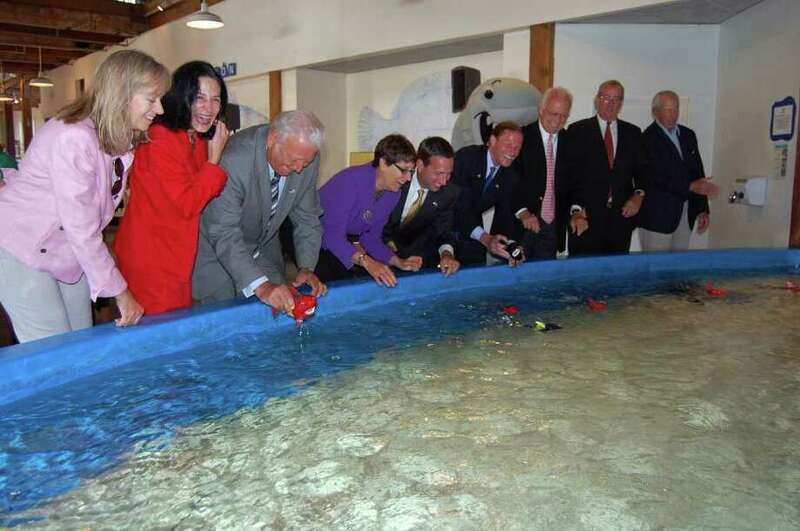 A number of local dignitaries lined up along the edge of the ray Touch Pool at the Maritime Aquarium in Norwalk Monday and launched into the water wind-up toy sharks. The "sharks" made their way across the surface, attracting the attention of the rays that splashed about at the sight of the miniature, fake sea creatures. It was a symbolic launch of a large-scale renovation that the aquarium will undergo in coming months, which had one official promising that visitors will see "an amazing transformation of this special place" come next February, when the $4 million renovation project is scheduled to be completed. Sandy Davies, chairman of the aquarium's board of directors, said Monday marked the beginning of "a whole-aquarium renovation that will carry our vision forward." That vision includes enhancing the visitor experience and strengthening the aquarium's mission to inspire people to preserve and protect Long Island Sound, Davies said. "In our fight to preserve Long Island Sound, citizen action and awareness have been critical to protecting this national treasure. This institution has been a huge resource for awareness and activism," said U.S. Senator Richard Blumenthal, who said he has taken his four children to the aquarium. "The new facility will take it to an even higher level in creating drama as well as education for children," he said. All the permanent displays will be "re-imagined," according to Maritime Aquarium President Jennifer Herring. The renovation will include a revamped seal pool and a new 5,600-gallon Shark & Ray touch pool that will be three times the size of the current pool. This week the current pool is being relocated to an area that will remain open to visitors. The new pool will feature nurse sharks, and cow-nose and southern rays. More than 90 feet of pool-edge access will allow more visitors more chances to run their fingers down the backs of the prowling predators. There will also be improvements to the turtle exhibit, a stronger emphasis on Long Island Sound, installation of a third elevator, and enhancements to the visitor amenities and catering. The renovation is the largest transformation of the space since the March 2001 opening of the William Ziegler III Education Center, new main entrance, expanded gift shop and cafeteria, and marine biology classrooms. "This renovation touches virtually every part of the aquarium, including new animals and displays, new interpretation and an improved visitor flow," Herring said. "The entire visitor experience will be changed," she said. Exhibits will be more informative and interactive. In addition to the larger Shark & Ray Touch Pool, visitors will be able to see embryonic sharks in their egg cases and baby sharks and rays after they hatch. "There will be lots of fun things for kids but also a lot more content for adults," Herring said. What will remain the same are the aquarium footprint and the hours. State Sen. Bob Duff (D-Norwalk) called the aquarium renovation "an investment, not a cost." 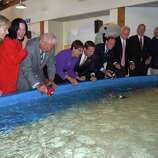 He said the aquarium's influence reaches far beyond Norwalk, bringing $40 million of economic impact to the state. Norwalk Mayor Richard Moccia said the Maritime Aquarium draws close to half a million visitors to Norwalk each year. Moccia called the aquarium "an economic engine for our taxpayers, an educational resource for our children and a recreational opportunity for our families." Despite the current economic climate, the aquarium was able to secure private funding for the major renovation project. No local, state or federal funding is involved. The redesigned great hall, the large room that contains the seal exhibit, will be renamed Newman's Own Hall for the Newman's Own Foundation, which is providing $1.5 million for that portion of the work. Foundation President Robert Forrester called the new name "a great tribute to Paul Newman's legacy." A map the size of a school bus in the great hall will include a game allowing visitors to match animals to their habitat. Videos will showcase the Sound's history and the seals that visit the Sound each winter. A refreshed interior half of the seal exhibit will remain in the Newman's Own Hall, but the central stairway will be removed. Also part of the work is a new outdoor courtyard with a children's playground. Richard Hokin, of Darien, bestowed a $1.15 million gift to the aquarium. The funds will be used to provide dynamic new exhibits and experiences in the aquarium galleries, which will be renamed the Hokin Family Sound Voyage. Additional funding came from CulinArt Inc., the Aquarium's on-site food service company; the late William Ziegler III; and other aquarium board members. "We are thrilled to be able to play a role in helping the aquarium provide this special window into Long Island Sound to share with its visitors our family's bond to a remarkable ecosystem, and to inspire awareness and knowledge of the environment where we, and many of the visitors, live," Hokin said. Favorites like the seven-foot sand tiger sharks, otters, sea turtles, and jellyfish will remain part of the Hokin Family Sound voyage, but will be enhanced. The new exhibits are designed by Cambridge Seven Associates, Inc. of Massachusetts, the company that designed the New England Aquarium in Boston. Consulting engineers include Altieri/Sebor/Weiber LLC of Norwalk. Herring emphasized that the Maritime Aquarium will remain open throughout the renovation project. She said she hopes people will not wait until February to visit. Throughout the renovation, Herring said there will be expanded programming and animal feedings. "During construction we are going to great lengths to ensure visitors have a positive aquarium experience ... While they watch the construction unfold, visitors will be able to enjoy all the fascinating exhibits and amazing animals that they know and love at the Maritime Aquarium, with lots of new programming too. They will simply be moving through the building in temporary new ways," Herring said.